A crashed plane, a giant dinosaur claw, a lost temple and a volcano are just some features of the new, unique Suffolk attraction. A new Florida-style adventure golf course, Congo Rapids Lost World, is now open to the general public. Situated within the grounds of Ufford Park Hotel, Woodbridge, the 18-hole course offers outdoor fun in a mystical setting for adults and children of all ages. The 1800m² site is enclosed by secure fencing and is within easy reach of all the facilities at the Ufford Park Hotel. There is ample car parking onsite and all players are welcome to visit the hotel’s drinking and dining areas before or after playing - these are always open to non-members. 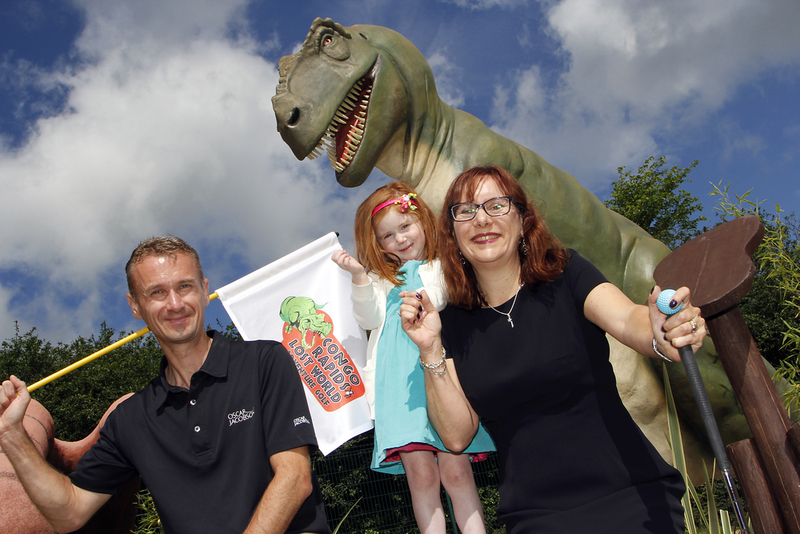 Construction was managed by Adventure Golf experts Moore Adventure Ltd, which already operates a successful Adventure Golf course in Norwich, Norfolk called Congo Rapids, but this is the first of its kind to be opened in Suffolk. Adventure Golf is different from mini golf or crazy golf as it offers more physical interaction at some of the course holes, and it also offers a more dramatic setting for the players to enjoy. The journey starts on a self-propelled boat across the first of the water lagoons. Players visit the scene of a Congo Jungle plane crash as they play the first 5 holes – beware the cannibal cooking pot! They will encounter a tiger, a 4-metre tall giraffe and many other animals. They pass through the abandoned temple and ride on a raft into the Lost World where they will be greeted by life-sized dinosaurs. A menacing T-Rex looks on as they play beside an erupting volcano and a 5-metre tall brachiosaurus waits for them just beyond by the 13th hole, before they head onwards through a giant dinosaur claw. Players can then return back through the Congo jungle into the African village and have the chance for some last photos to include a panoramic view of the course. They then exit through the jungle harbour to the sounds of jungle beat music. Admission Prices: £8 Adult (16 and over), £5.75 Child (15 and under), £22 Family of 4 (including up to 2 adults), £26 Family of 5 (including up to 2 adults). Group discounts are available and children’s birthday parties can be arranged in conjunction with Ufford Park Hotel. Children under 12 years old must be accompanied by an adult. There is no need to book in advance (unless you’re coming as a party) just turn up and play ! For regular updates and news, follow on social media: Facebook: "Congo Rapids Lost World Adventure Golf", Twitter: @CongoRapids_LW or visit the Congo Rapids website (www.congorapids.co.uk).